Use the resources below to help you learn more about science! Boardworks phas created interactive science units for primary and secondary school students. 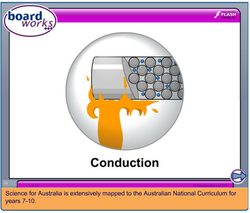 Click here or on the image above to learn about conduction. 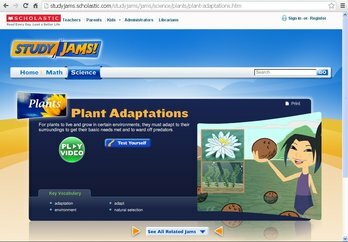 Scholastic Study Jams provides free online interactive science modules to help you learn and explore science. Each Science Study Jam is based around an animated video. After watching the video there are activities and tests you can do to show your understanding. 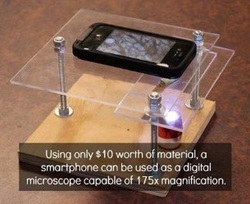 Did you know that you can use a smartphone and $10 worth of materials to create a digital microscope? Follow this link to access the step-by-step instructions. 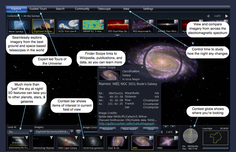 NASA's website continues to be the world leader in free resources to study space, including lessons, podcasts (including NASA 360), videos, interactives, 3D resources, NASA TV and images. 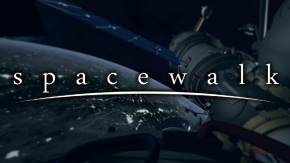 Spacewalk (Win/Mac/Linux) is free networked interactive experience that enables users to experience what it would be like to take a space walk outside of the International Space Station. Players collectively take on the role of astronauts; navigating and exploring the structure of the space station. Launch a virtual Space Shuttle from Kennedy Space Center and rendezvous with the International Space Station. Design their own rockets, or download addons created by other users. Watch the video below to see Orbiter 2012 in action. Orbiter 2-12 can be downloaded from here and the flight tutorials can be accessed here. The Kerbal Space Program is a paid (with a free trial) video game for Windows, Mac & Linux where the players create and manage their own space program; building spacecraft, flying them, and trying to help the Kerbals to fulfill their ultimate mission of conquering space. A Journey Through Space is a free downloadable experience that takes players on a journey through space whilst listening to an inspiring music playlist. If you or your school is not using USB microscopes to help you study science, simply Google "USB microscope" or search for "USB microscope" on Ebay. 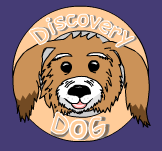 Watch this video about Discovery Dog's niece 'Naughty Nora' who gets into trouble and then use your knowledge of science to help solve her problem (NOTE: This Flash video does not play on iPads unless you use the Puffin Browser app). These AR apps show the great potential for the role that augmented reality could play in the study of biology and science. Anatomy 4D is a free AR app (iOS | Android) that enables users to explore the anatomy of the human body. Download or view any of the target images: (1 | 2 | 3). Download the Anatomy 4D app (iOS | Android). Scan a target image using the Anatomy 4D app. 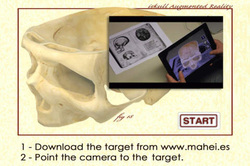 iSkullAR is an augmented reality app that allows users to study and explore the human skull as it were in their hands. Elements 4D enables users to explore and combine 36 different elements of the periodic table. Download, print and assemble the target image blocks from here. Download the Elements 4D app for free on iOS and Android devices. 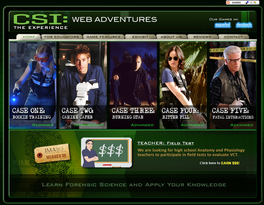 CSI: The Experience - Web Adventures is a free online Flash interactive game (created by RICE University) to teach students about forensic science, using mock field investigations guided by the characters from the popular CSI television series. Educator and parent guides are available here. Various other online forensic analysis activities can also be access from here. used with an oscilloscope to change their voltage and make them magnetic. Whilst iSkullAR is one of many scientific AR apps that can be used in the classroom, it is the use of augmented reality in the medical field that is one of the most exciting and important applications of augmented reality as it can potentially save lives. One such application is the Inside Explorer project, where touchscreen technology is combined MRI and CT scanned imagery to explore objects. Inside Explorer is currently being used in museums around the world! Could you think of any ways in which the study of science could embrace the use of these large touchscreen surfaces? Reach For The Sun is a Flash game (free trial | paid) that teaches players about the life-cycles of plants. Players take control of a plant, needing to balance resources such as starch and water to grow whilst constantly whilst also adjusting to the plant's conditions/surroundings. Froguts allows anyone to learn how to dissect a frog without actually need a dead (and smelly) frog! Crazy Plant Shop is a paid (with free trial) Flash game (separate | package) that teaches players about plant genetics. Players get to order, mix and match various types of plant seeds to create new plant combinations. Fossil Forensics is a paid (with free trial) Flash game (separate | package) that teaches players about fossils. In Fossil Forensics, players assist the curator of a museum by analysing, comparing, and making hypotheses about ancient fossils.Players also compare fossils and identify adaptions based on structures and characteristics. Learn to predict and observe what happens to fruit or vegetables if they were left to go moldy and decompose/break down using the following experiment. At the start of the experiment, choose any fruit or vegetable (onions are great). Inserts the photo(s) into the Google Sheet. Is the ONLY person who handles the specimen (wearing rubber gloves). Measures the specimen’s temperatures and weight and orally tells the Analyser. Puts the gloves under the container. Enters the Handler’s data into Google Sheet. Computes the mathematical calculations accurately (e.g. Yesterday’s weight – Today’s weight = Weight Loss over night) and inputs them appropriately into the Google Sheet. 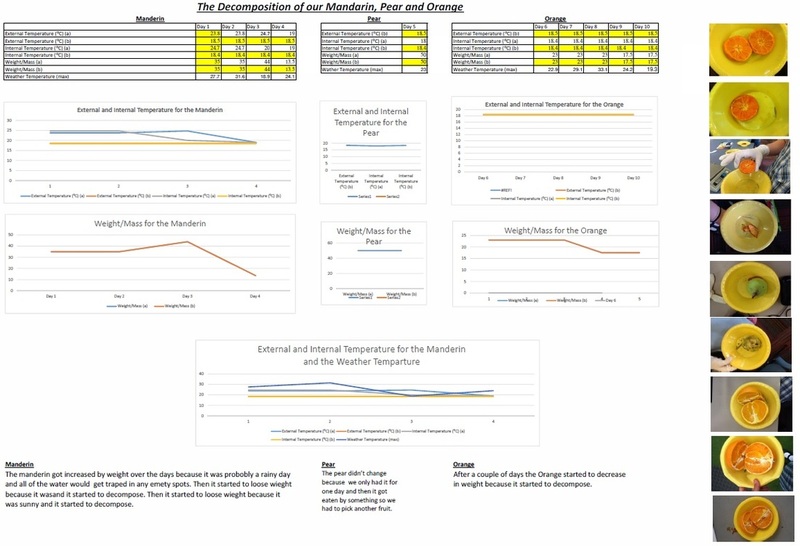 Generates a graph to represent and describe observations, patterns, trends or relationships in data. Record their information in the form of a collaborative Google Sheet (click here to access our online work) take and upload photos of the fruit/vegetables to the Google Sheet, a website/blog or a presentation/document. As the fruit and vegatables will smell as they decompose you may want to keep the fruit/vegetable inside on a window sill but to cater for the shocking smells, you may want to place the fruit/vegetable outside under cover. However, if you do keep them outside, possums or 'ghosts' may start stealing the fruit and vegetables! You could shield the fruit/vegetable in a plastic container (which may also affect the ambient temperature as the onion decomposed - see the image of an onion in the container). object's mass/weight using digital and analogue kitchen scales. add, subtract, multiply and divide to be able to read the increments on the kitchen scales. After the two week experiment has ended, reflect back on the process and analyse the data from your Google Sheet. A group's mathematical and scientific presentation of their data. Click here to download a copy. after the experiment had finished, students continued to write posts in their student blog about their scientific observations.